RALEIGH – Conservative North Carolina lawmakers are preparing to unveil a comprehensive package of proposals in the coming days that will dramatically remake the landscape of state firearm laws. The plan represents an apparent effort to defuse any criticism that might be aimed at legislation advancing through the General Assembly that would completely deregulate the possession of concealed handguns by all persons 18 years of age and older. Berger: Hey Tim – If all is still a “go” with you and your crew, we intend to unveil Firearms = Freedom plan very soon. 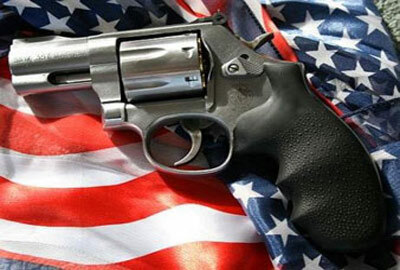 Are targeting June 14 – Flag Day – which coincides with expected NRA announcement of National Take Your Gun to Work and School Day. Thinking we can find an elementary school or maybe a church daycare facility for the event. Moore: Sounds good Phil. We’ve been getting a good deal of heat from the Dems and the media libs on the concealed carry bill, so anything we can do to take back the momentum sounds good to me. I’ll alert Pittman and Speciale to get it on their schedules. They’ll be “locked and loaded” – ha ha. Berger: LOL – that’s a good one Tim. Are y’all still on board with all six points? Know some of the urban left-wingers in your caucus can be nags on some of this stuff. All six are important though – we’re using an image of a six shooter wrapped in the American flag as the symbol for the whole thing. Moore: Wow – that’s very powerful. I like that imagery. What happened to the cross? I thought there was supposed to be a cross or crucifix image too. Berger: Same old story — wimpy lawyers in Leg. Research whining about the Constitution. Blaine told Research that Roberts, Alito and Thomas have all already made clear that the 1st and 2nd amendments can be read to cancel each other out whenever government uses religion to promote gun rights, but they won’t go for it. Claim the reference was only in a “concurring” opinion. I think we could win this one if we tried now that Gorsuch is there. Moore: Bummer. I still like it though. Remind me of the six points. I remember the ones about education and the statue. Isn’t there also one about changing automobile regs? (RALEIGH) Republican North Carolina legislative leaders announced today that they intend to introduce and pass legislation that would fundamentally alter and improve state gun laws. The plan, which the lawmakers have christened the “Firearms = Freedom” plan, would make North Carolina the safest and most gun-friendly jurisdiction in the United States and, perhaps, the world. #1- The total and permanent abolition of all state laws related to firearm possession. The change would apply to all handguns, rifles, shotguns, machine guns and most military grade weapons. Most bombs – both conventional and nuclear – would remain subject to state regulation, but, Berger noted, penalties for possession would be reduced to misdemeanors for first and second time violations. #2 – The total and permanent abolition of all state laws regulating automobiles and driving. “Liberals claim that it ought to be okay to regulate firearms since we currently use registration laws, safety tests, driver’s licenses and the like for cars,” said Berger. “By ushering in deregulation and letting the genius of the market govern in this realm, we will rebut this critique and make our state statutes even more consistent,” he continued. #3 – A new state law requiring use of the NRA’s Eddie Eagle firearms training program in all public school classrooms for grades 3 and up on a daily basis. Students in grades K-2 will be undergo a training program based upon a firearms-friendly adaptation of the Care Bears cartoon series. The plan also calls for the establishment of at least six new charter schools run by the Second Amendment advocacy group Grassroots North Carolina that will feature a permanent “firearms-themed” curriculum. Training will also be made available on an optional basis to all children enrolled in NC Pre-K-funded programs. #4 – The establishment of a new state agency to be known as the Division of Faith-based Firearm Proliferation and Preservation. The DFFPP will be a public-private partnership headquartered within Lt. Governor Dan Forest’s office with a budget of $10 million annually and a mission to engage religious congregations in the work of blessing each individual firearm in the state. Rev. Mark Creech of the Christian Action League and Rev. Franklin Graham have agreed to serve as honorary co-chairmen of the initiative. #5 – The introduction of a new state Education Lottery game to be called “Assault Weapon Scratch-off Bingo.” The new contest will distribute 100 brand new Colt AR-15 lightweight, 5.56×45mm, magazine-fed, gas-operated semi-automatic rifles to lucky winners. All 100 winners will then be entered in a drawing for a grand prize trip to NRA headquarters in Washington, DC and lunch with Vice president Mike Pence. If the grand prizewinner is a female, a chaperone will be provided. #6 – The transformation of Halifax Mall just north of the state Legislative Building into an open-air shooting range. “We’ll have walls, lights and silencers for the big weapons,” said House Speaker Tim Moore. “We’ll also install high quality safety glass in the Education, Dobbs and Archdale buildings in case of ricochets. It will be a great way for members to burn off steam during late night House and Senate recesses.” The facility will feature an 80-foot statue of the late NRA President and one-time North Carolina resident Charlton Heston. Heston will appear as he did parting the Red Sea as Moses in “The Ten Commandments.” Moore said the statue will include a giant M-16 rifle in place of Moses’ shepherd’s staff. Berger: So, what do you think, Tim? Moore: I like it Phil. Any chance you could get a couple more quotes in there from me? Berger: Well, you know this thing was our idea. Moore: I know that. It’s just that it could help me with hardliners like the Haymaker and the Plott Hound if they saw that I was fully on board. Berger: Ok – how about if I’ll have my people work you into #3? Moore: Thanks Phil. You know how much I care about education. Could you have me saying something about the Pledge of Allegiance? Berger: No problem. With that are you all good? Moore: Absolutely. How do you want to handle passing this? Multiple bills and committees or one big, quick push like with the budget? Berger: The latter definitely – and make sure you have Lewis adopt one of those rules that makes any substantive amendments out of order. We don’t want the debate on this getting out of hand. And no public testimony either. The last thing we need is to give Barber and his troublemakers a platform. Maybe we can even put some bullet holes in Cooper’s veto message for a visual after we do the override. Moore: 10-4. When you’re protecting precious constitutional rights, you can’t be too vigilant – right, Phil?